Are you selling your home and wondering how you can make it more appealing to buyers without spending too much money? Perhaps you’ve just moved into a new property and found the bathroom is tired and outdated but you’ve spent all your budget on the move? 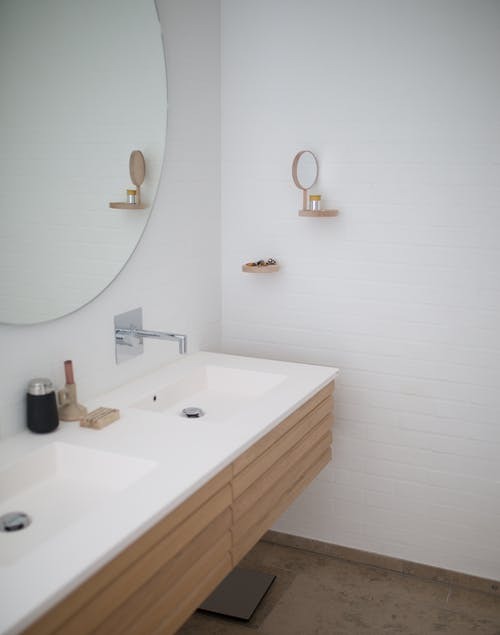 Perhaps you’re just looking around at your existing bathroom and wishing that it looked more inviting but can’t afford to completely rip out all the fixtures and fittings and start again? Whichever of these apply to you, the good news is that there are several things you can do to improve your bathroom without breaking the bank. 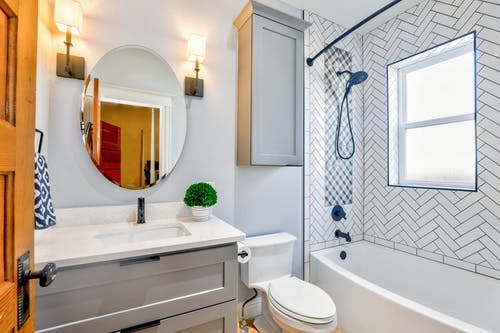 It can be very expensive to completely remodel your bathroom, but with these expert tips, your space will look fresh and new without spending a fortune. Think of the hardware in your bathroom as being similar to your jewelry. It may not be much on its own, but it can make or break an outfit! If your faucets, vanity handles and other hardware is old-fashioned and ugly, it could be easily improved by simply swapping it out for some stylish new ones. You’ll only need to spend a small amount of money and it’s often a simple project that you can complete yourself, although if you aren’t a DIY expert you can hire a professional at a very low cost to get the job done. It’s much cheaper than new fixtures and it’ll look great. Don’t forget to choose fittings which fit perfectly into the existing holes to save yourself a lot of extra expense and a lot of hassle. Is your bathroom vanity looking old? It’s time to spruce it up with a coat of fresh paint. It’s easy to make your vanity unit look brand new at a fraction of the cost of buying a brand new unit and it’s a project that you can quickly and easily complete yourself in a single day. Is your bathroom small and dark? A large mirror can make all the difference. By harnessing the power of the light in your bathroom, a mirror will make the space look much brighter and double the size instantly. Make sure to put the mirror on the wall opposite the window whenever possible for the maximum benefit. Sometimes, there’s nothing for it but to change the bath tub. If yours is a really unattractive color or has been scratched beyond all recognition, it’s worth the investment in a stylish new one. The good news is that there are lots of affordable bath tubs on the market which won’t break the bank but which make your whole bathroom look brand new. An acrylic bath tub is good for your bathroom if you’re on a tight budget thanks to its stylish appearance and affordable price tag. Often, the only thing you need to do in your bathroom to give it an upgrade is to clean or replace the grout between the tiles. The grout is very prone to mold and discoloration over time, and often a thorough once over with a bleach solution or specialist cleaning product can make all the difference. If yours is still looking past its best, you may be able to use one of the specialist grout pens to whiten it up, otherwise, it may require replacing. This, however, is still a fraction of the cost of replacing the tiles and will make a huge difference to the look and feel of your space. Sometimes, the only real problem with your bathroom is a lack of ambience and atmosphere. You can change that with the right light fittings. Installing some wall scones around the mirrors or some under-mirror or under-cabinet lighting can make a big difference, or why not consider upgrading to a statement pendant shade or chandelier for a more upmarket feel in your bathroom. Follow these top expert tips for upgrading your bathroom on a budget and you’ll find that your room can look and feel much more luxurious than you imagined. Whether you’re selling your home, just moving in or trying to improve your existing property, we’ll help you achieve your goals on a shoestring.